This is the sixth and final High-level Event to be held in connection with the framing and formulation of new UN goals and targets for sustainable development after 2015. 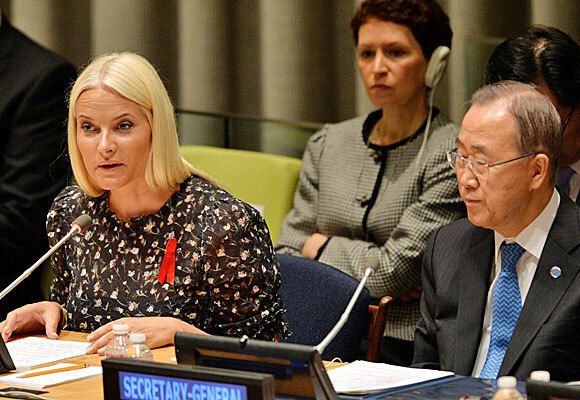 The Crown Princess gave her remarks at the opening session of the High-level Event on “Contributions of Human Rights and the Rule of Law in the Post-2015 Development Agenda”, following opening remarks by UN Secretary-General Ban Ki-moon and President of the General Assembly John W. Ashe. “Where, after all, do universal human rights begin? In small places, close to home – so close and so small that they cannot be seen on any maps of the world. Norwegian Minister of Foreign Affairs Børge Brende spoke on behalf of the Nordic countries about human rights and good governance in his remarks at the High-level Event. On Tuesday evening, Crown Princess Mette-Marit will receive the amfAR Award of Inspiration at the Inspiration Gala New York. The American Foundation for Aids Research (amfAR) is honouring the Crown Princess for her years of commitment to the HIV/AIDS cause.